They say that trials come and go and that we just have to hang on and believe that the next day will be better. I've been really negative for the past few weeks with work taking its tolls and a number of things adding to it... But remembering that tomorrow is another day... well, it helps me in keeping my sanity and at the least, hopeful that I do better. That's why I appreciate all the things that come my way, no matter how little and especially when they're big and unexpected. Just recently, Beauty Box Corp. sent their latest acquisition to me. They gave me tons of goodies from land of the rising sun and quite possibly the chicest country in Asia, Japan! One of which is the brand Fairydrops, which compared to K Palette is a bit loud and quirky. The Packaging alone makes you think of night life in Tokyo. Founded by Aya Yasuda, a Japanese Anchorwoman in MLB LA, have always wanted photogenic eyes and face. I honestly can't imagine why because she's gorgeous. She reminds of those Korean actresses. But I guess like all women, we all try to improve our looks and along the way, find the best solution to address it. Aya Yasuda took it to her own hands and created her own line of makeup. Quite easy since her father was one of the top 10 business conglomerates of Japan. Apply a small dab to your cheeks, forehead, and chin. Can skip concealer if you don't have very dark blemishes or pigmentation. Like other BB Creams, oil control is still not it's best feature. Can be quite expensive to some. This cost Php1550. Shades are limited to fair to medium skintone. If you're iffy about sponge applicator due to hygiene or that it wastes too much product, you can just twist the cap and use the nozzle. Personally, my radar isn't really on a look out for BB Creams. Thanks to this blog that I get to try them and it seems you, my dear readers, are interested in BB Creams. So here I am trying it for you all and I'm glad to report that it's a great product to try. If money isn't an option and you think that (like me) makeup is worth every penny, then I can say that this one is. Especially is you're the type who loves Asian-made cosmetics like BB Cream. BB Creams continuously take over the beauty industry and with every brand that comes out, we (or at least a big chunk of beauty lovers out there) clamor for the next one, especially when they have add-on features just like the Fairydrops Candy Bar BB Cream with it's sponge applicator and micro-gold pearls for better coverage. 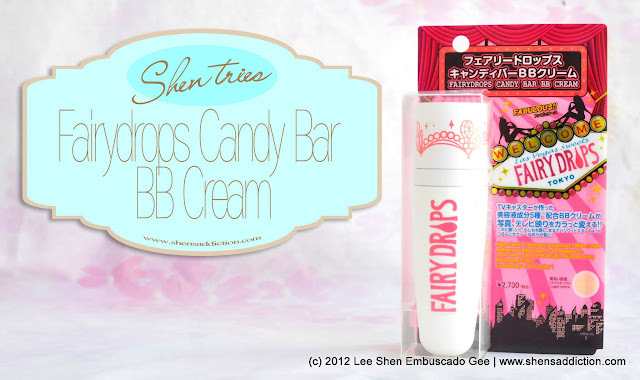 Find out more about Fairydrops Philippines Facebook and Twitter. wow!the coverage of that bb is nice! im not really much for bb but i love their finish. the dewy finish is awesome but then it makes me break out...too bad. currently using snoe bb cream its working for me nmn and its not expensive pa.